Published on May 15, 2017 in Court, General T&T, PNM, Politics, Property Tax, Recession and UNC. 31 Comments Tags: Anand Ramlogan, Colm Imbert, Devant Maharaj, Kamla Persad-Bissessar, Keith Rowley, Lutchmidat Ramcallie, Politics, Property Tax, Ravi Balgobin Maharaj, T&T Govt. AN ALL out attack has been launched against Government on the implementation of the property tax. In separate strikes, legal letters were fired off yesterday by a battery of lawyers representing three landowners threatening to take Government to court for what has been described as an “ambush” on citizens. Two of the actions seek to have the courts review the implementation process of the controversial tax while the third is a constitutional challenge to the property tax. 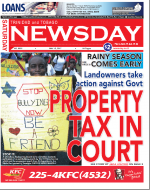 In the judicial review and constitutional claims former transport minister Devant Maharaj, United National Congress activist Ravi Balgobin Maharaj and Chaguanas resident Lutchmidat Ramcallie, are asking the Government to hold its hand on the implementation of the Property Tax until it amends the legislative provisions and before the court determines the actions.